For this Spring Stitch Fix review, I asked for items that would be great for transitioning to a warmer season! 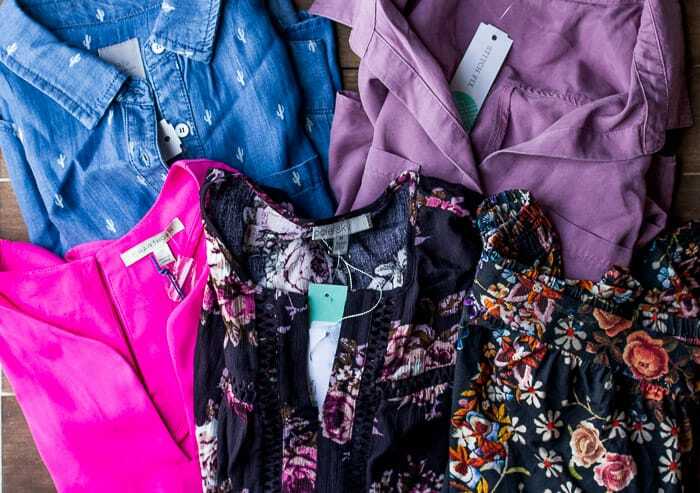 Stitch Fix is a clothing subscription box. It’s a really fun way to shop without having to actually scour the mall or a million online websites. You take a style and size survey, make any specific notes about certain items you’re looking for or want to avoid, and a personal stylist will send you 5 items based on your profile. Once your “fix” arrives, simply try everything on to see what you love. You can purchase however many of the items you want, or return the entire fix if it just doesn’t work for you. If you keep everything, you will get a 25% discount. If you return it all, you will lose the $20 styling fee that you pay upfront when you schedule your fix. 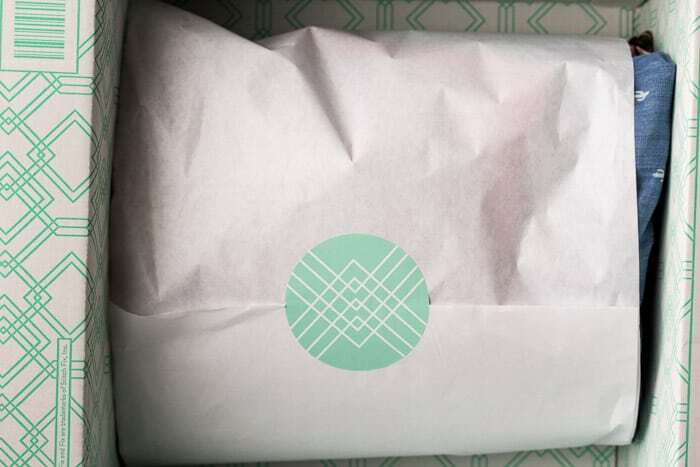 You can find out more about Stitch Fix HERE. This is my 13th fix! I had the same stylist, Roseann, for the last 3 fixes. I asked for more color to start preparing for Spring with this order and she definitely delivered. But, I just didn’t love this fix. After so many really great ones, it was bound to happen eventually. 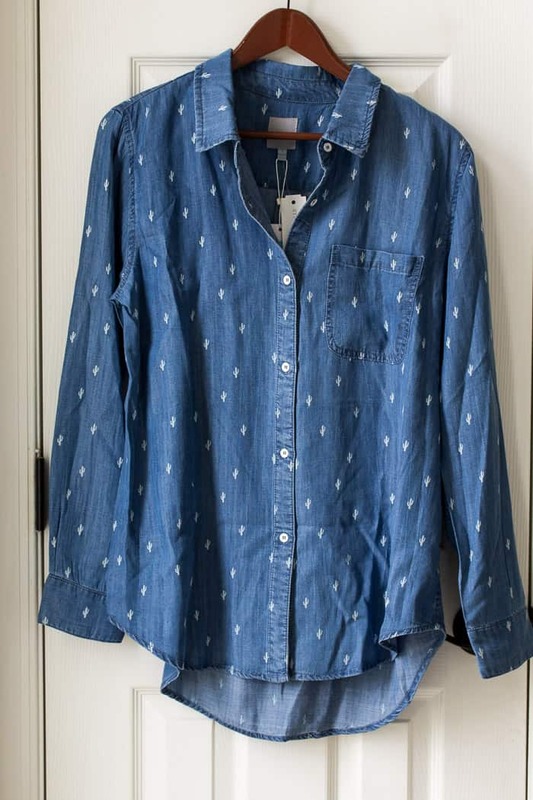 Before I get into the items, I want to also note that there was a button up chambray shirt in my last fix that I wanted to exchange, but couldn’t. 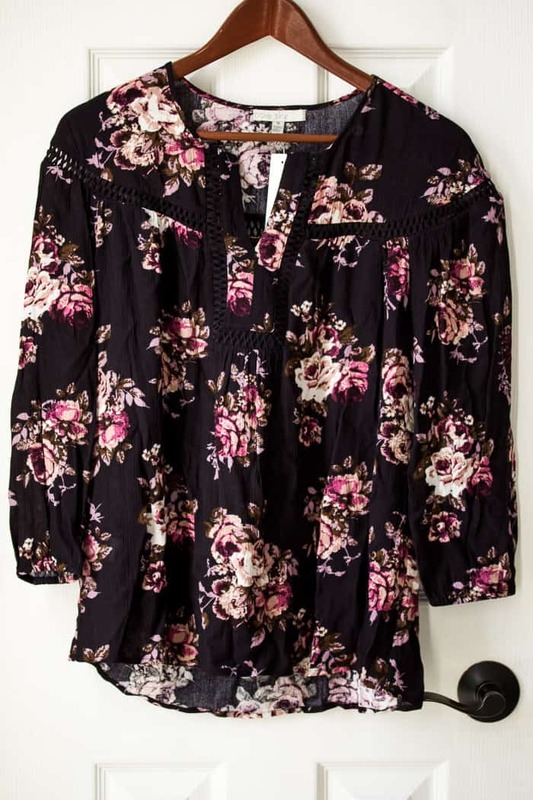 Right around the time this fix was shipped, Stitch Fix contacted me that the shirt I wanted had come back in stock and they had reserved one for me if I still wanted it. I opted to have that shirt sent out. This was a nice surprise, but it did play into why I didn’t keep the first two shirts in this review. Two fixes ago I kept a really cute chambray shirt that had stars printed on it. I LOVE that shirt. Then, as noted above, Stitch Fix sent me the Cloth and Stone chambray button up in my size. So, by the time I saw this one in my fix, I already felt I had enough of this type of shirt. The cactus print is cute, but maybe not quite my style as much as the stars were. Roseann sized up for this shirt based on my previous feedback. The chest area fit perfect, but I felt it was a bit too long. I think Roseann probably chose this shirt as an alternative for the shirt that I did get end up getting an exchange for. It’s the same brand and style, but a different color. It fit perfectly. 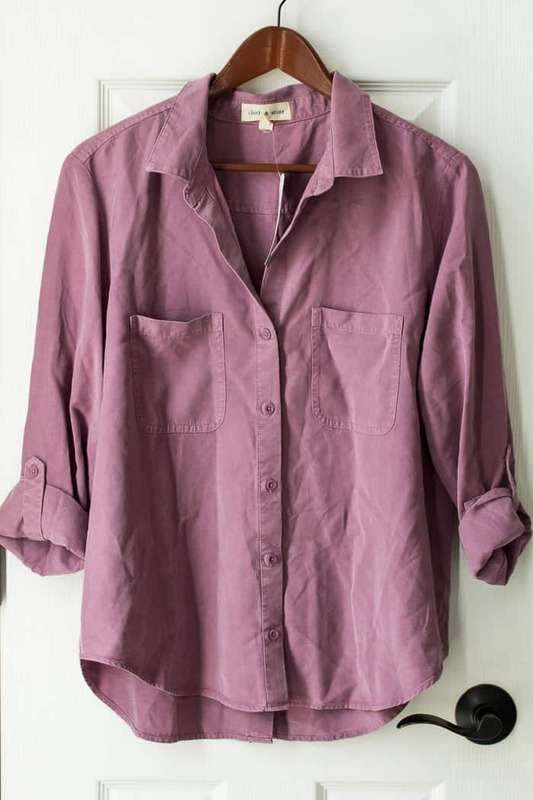 I do like the light purple and felt it was a great choice for Spring, but once again, I just feel like I have enough button ups for now. 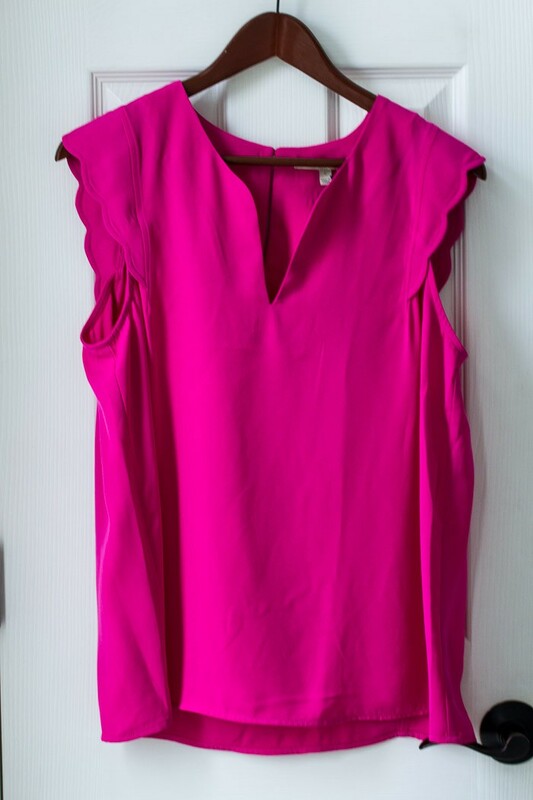 I have kept a lot of tops from Stitch Fix that fit into the sleeveless category, such as this one. I usually wear them under cardigans in the cooler months. But come Spring, I don’t wear as many sweater cardigans and prefer shirts that have some sleeve to them. Roseann sized up on this one too, but I think it was too big. I also didn’t care for the super hot pink color or the fabric. It definitely fit my request for more color, but unfortunately just didn’t fit my style as much. When you get the notification that your fix has shipped, you can go onto the website and see on the checkout page what was sent. I have zero patience and do this little sneak peek every time. 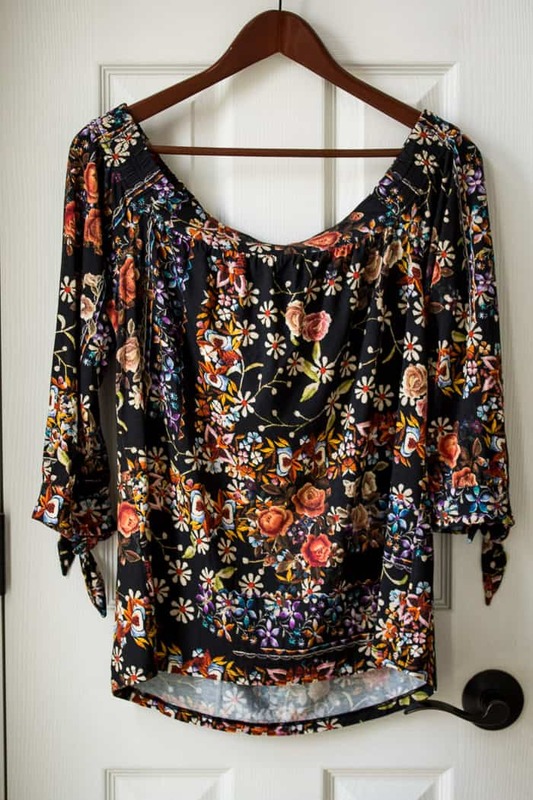 When I saw this shirt, I felt like it was more for an older lady. I tend to forget that I am probably considered an “older lady” as 40 is all too quickly approaching. When I took this shirt out of the box, I liked the print and it didn’t look old lady-ish at all. It fit great with the exception of the very top of outside of my arms. I just felt like it was pulling tight there, maybe from the crochet detail that runs right across that area. I am assuming that this might have been the same issue I often have where the chest area is too small and the rest of fits perfect. I love the Daniel Rainn shirt I got in my December fix, so I’m always excited to see more items from this brand. Unfortunately, this wasn’t the one for me. I don’t like halter tops or off the shoulder tops because I don’t have a strapless bra that’s comfortable to wear with them. I also felt this print was more of a Fall vibe, than Spring. The fabric was soft, but it looked like the type that might fade fast. Obviously, there is no way for me to know that for sure without having washed it a few times. I think this is the first time that I’ve sent an entire fix back. I think the fact that I was able to get an exchange for an item in my last box right as this one shipped greatly affected that. The total for this fix was $332.00. Had I kept everything, I would have received the 25% discount of $83.00 bringing the total to $249.00. I filled out my feedback on all of these items and scheduled my next fix with even more specifics. I wrote that I am looking for items for Spring and Summer. Tops, pants, capris, dresses, and shoes would all be great. I also mentioned that I currently love mustard yellow, turquoise, teal, coral, pinks (but not hot pink haha! ), and black. I’m looking forward to seeing what shows up! 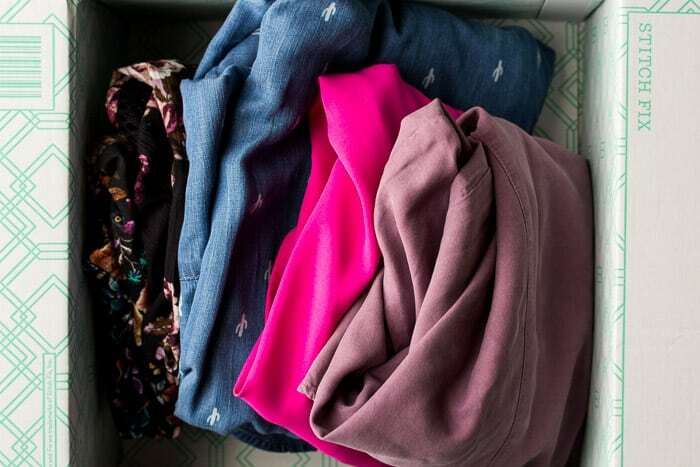 To try Stitch Fix for yourself, click HERE! I would definitely recommend being as specific as possible in your survey and notes so that you are highly likely to receive at least one amazing item to apply your $20 styling fee towards. Have fun!